When it comes to classic muscle cars, I'm a GM guy. 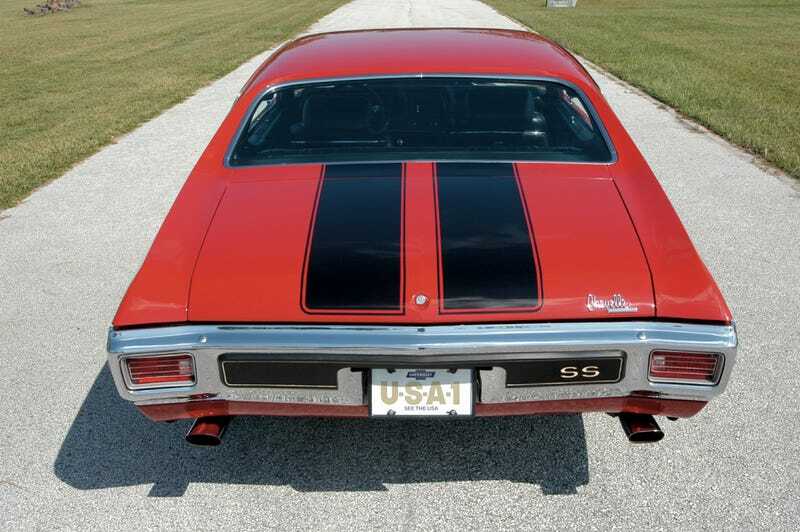 The 4-4-2, GTO, Camaro, Firebird, and most of all Chevelle just seem like they most hit the mark of the ideal muscle car when compared to their other big three counterparts. Fords may have been prettier and better values but where were the balls? Mopars produced unreasonable amounts of power but their styling was anything but timeless, and for the most part can't take a corner. GM muscle cars just do it for me. Especially in red with black racing stripes. It's the official american muscle car livery in my book. So much better that yellowish with one solid grayish stripe down the middle. I would buy this car as it was today, and be happy to spend $30,000 on it (not a bold statement since these things fetch 6 figures at auction these days). Even with the spare in there, there's a usable trunk and seating for 5. 2 meters tall like I am? The Chevelle had some of the best driver seating for the talls. The seats are also perforated to alleviate the terror sweat that you are sure to accumulate while driving/almost dying in this car. It's indisputable that the LS6 Chevelle was the most beastly of muscle cars, but it also seems like the Chevelle is the most livable of the pack for day to day use. If you had to DD a classic muscle car, what would it be?